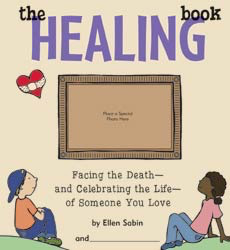 THE HEALING BOOK: FACING THE DEATH – AND CELEBRATING THE LIFE – OF SOMEONE YOU LOVE is an interactive book to help children and families express their feelings, ask questions, and explore their memories about a loved one who has passed away. It is an activity book, journal, and conversation-starter that children can make their own and use in whatever way best meets their needs during the grieving and remembering process. This 64-page, hardcover book has been created so it can be used by any child or family dealing with the death of a loved one. It is a powerful tool in the healing process that opens lines of communication while also creating a scrapbook of memories that can last a lifetime. The HEALING BOOK: Encourages children to grieve, communicate, and ask questions. Provides a tool for adults to use in supporting a grieving child. Gives children a place to focus their feelings and energy while also providing ideas and activities to make them feel better when they are sad or confused. Helps children to remember positive details and experiences by encouraging them to think about positive memories and giving them the opportunity to create a scrapbook that they can hang onto for years to come. ** The Healing Book is ideal for: Children (6-13 years old) and families who are facing a loss. School counselors, grieving centers, funeral directors, hospice workers, and all others who seek to provide support to children and families dealing with a loss.